String em up, baby! 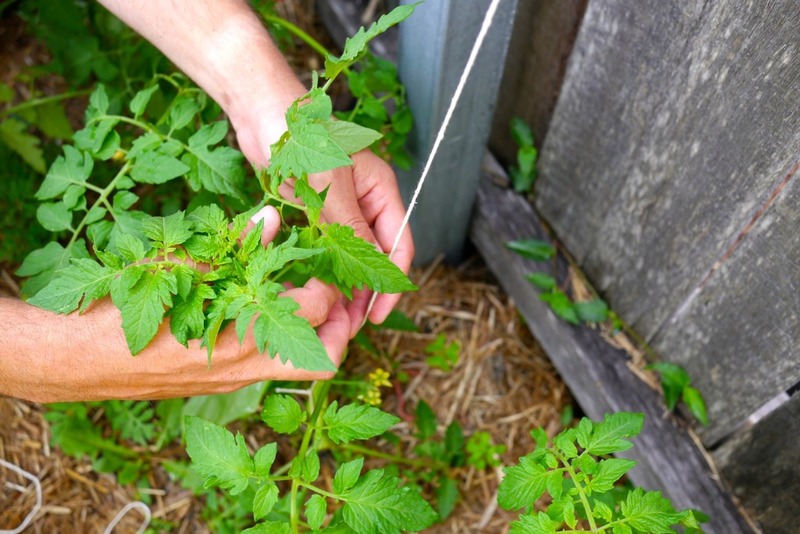 Climbing tomatoes often need a helping hand to reach their full potential. 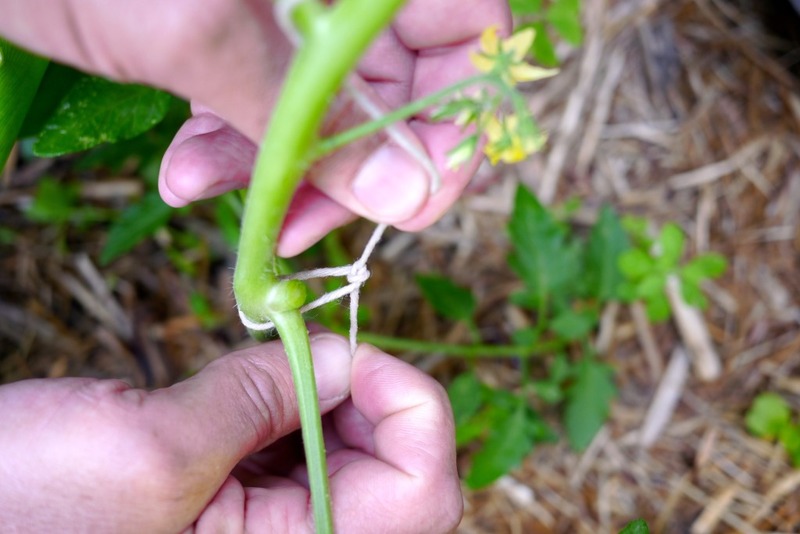 Here’s our two favourite methods for stringing up best ever backyard toms. 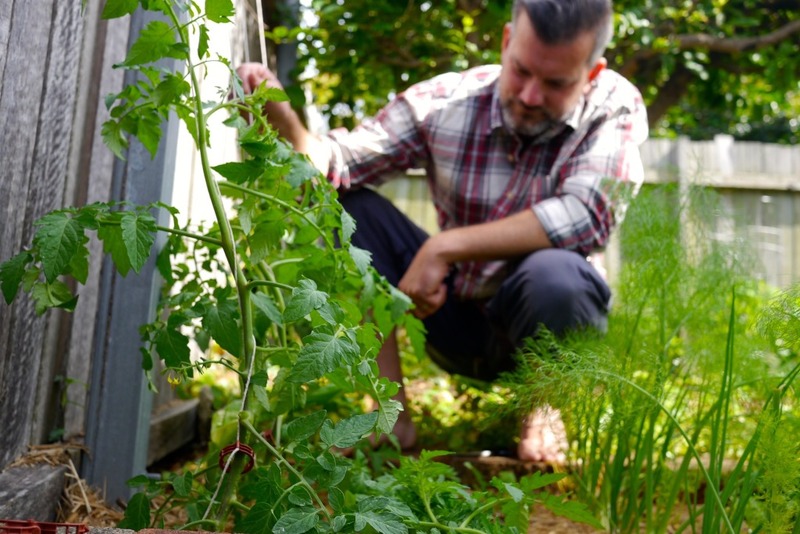 But these days, following a few years of growing in serious quantities, we’ve borrowed a few market gardening tomato tricks for climbers, to apply to our back fence. Who would have thought. String! But seriously, string is a great option for climbers. It’s gentle on the tomato stems, cheap, available, and easy to use to increase your harvest. But there’s a trick to it too. Follow this method and you’ll be one happy tomato eater. 1. Cut a nice long bit of string, and figure out what you’re going to attach the top of it to. But don’t tie it on there yet. 2. 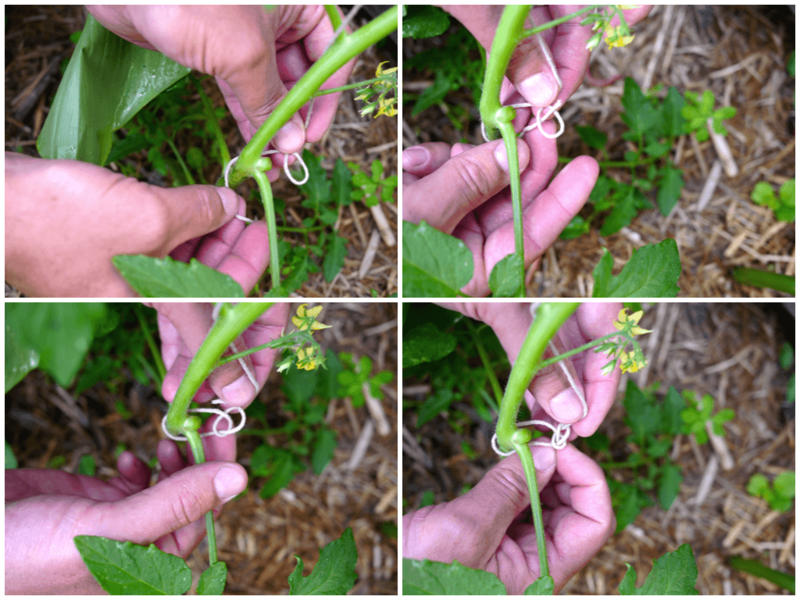 Tie a bowline knot under the armpits of a low tomato branch, around the main stem – here’s a pic of how to tie a bowline – you can do it! 3. 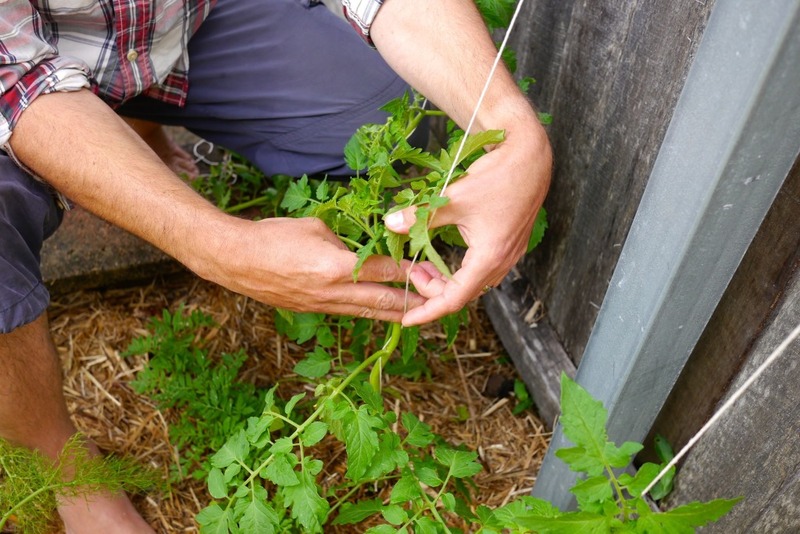 Using this anchoring knot to help stand up your floppy tomato plant, secure the top of your string to something solid (and straight upwards). 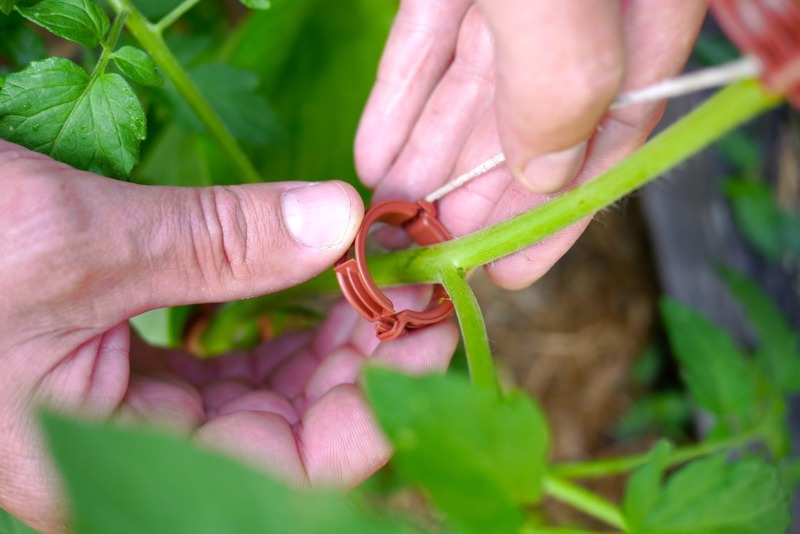 Make sure your string is reasonably tight, as this is the key to this method’s success with twining the plant upwards. 4. Twine the tomato plant’s main stem up the string. BE GENTLE as this can be where you might snap your tomato stem. So, go slow – you’ll soon get a feel for it, once you get to know the plant. 5. Keep twining as the tomato grows. Gently twine the plant around the string as it grows up and up. Hello tomato. It’s hard to fault this method. Minimal tech, maximum result. Perfect if you’ve got a trellis or a fence to grow against, or something above to secure the string to. And you just learned a new knot! While this method uses plastic, there might be contexts where tomato clips are a better idea for you than straight-up string. 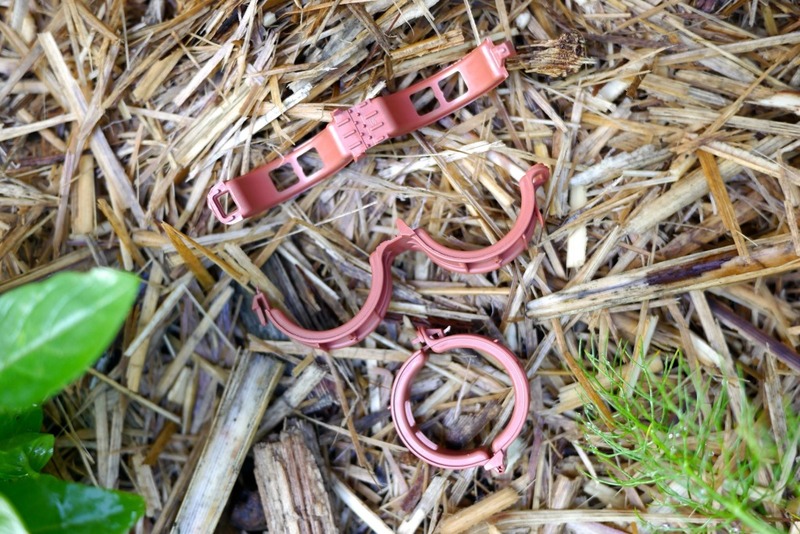 The clips are re-usable, and will last a good few years. Maybe you’re not a great knot tier, in which case you could just use one clip down the bottom, and twine your way up from there. Or maybe it’s really windy in your garden, and you need extra security for your tomatoes. Or maybe you’re doing a serious commercial quantity of them. 1. Again, cut a long piece of string, but this time secure it to your top end first. 2. 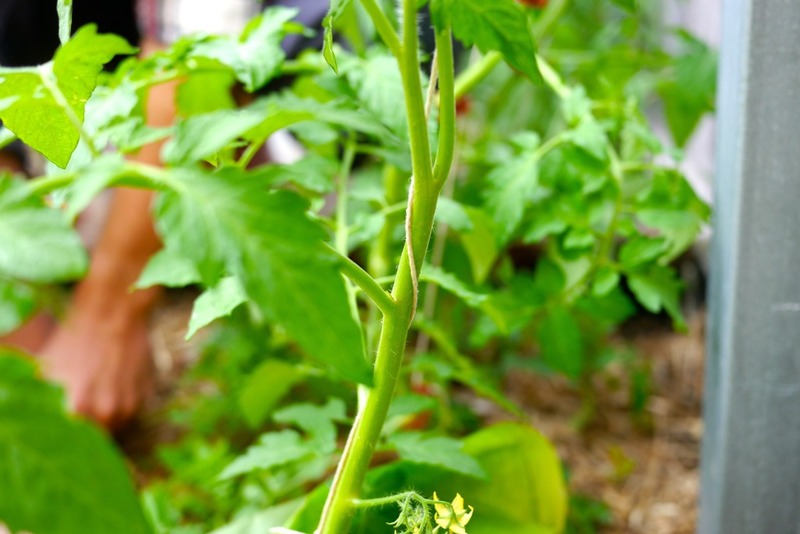 Get a tomato clip and place it under a low branch coming off the main stem. 3. 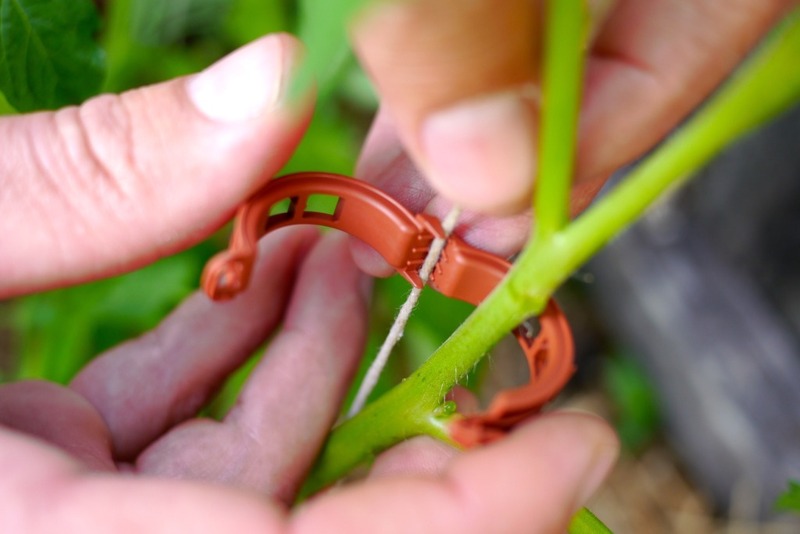 Clip the tomato clip closed so that the hinge hugs the string – it will hold tight. If you’ve got enough tension on your string, this will hold the base of your tomato plant upright. 4. 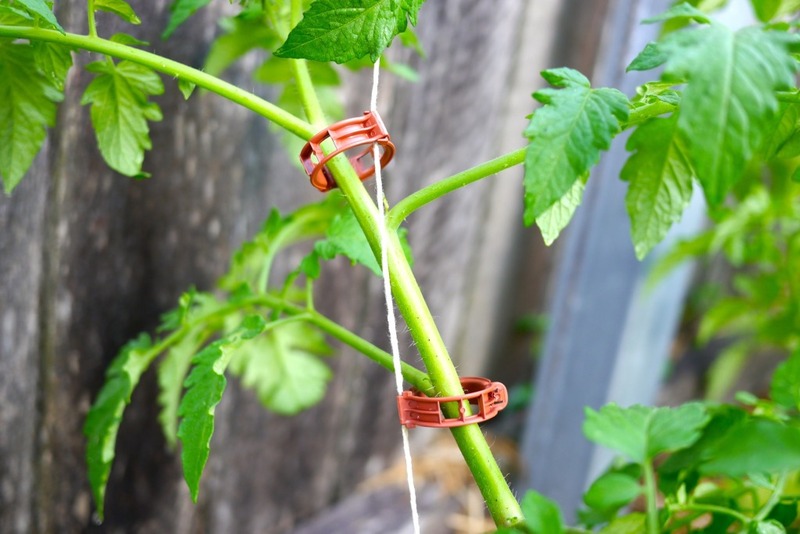 Proceed to tie up your tomato plant either with more clips, or by twining with string. These tomato clips can be sourced from our mates at Allsun Farm – as it turns out, we’ve also got a heap in our shed, so i think I’ll distribute some packets of them via the Milkwood newsletter this week. The string I’m sure you’ve got, or could get without further ado. Which ever way you do it, allowing your tomatoes to climb is a good idea (assuming they’re actually climbing tomatoes) for a couple of reasons. The first one is fungal disease, which tomatoes can be susceptible to, and which can limit (or kill off) your tomato crop. The best way to protect your tomatoes is to ensure the plants have light and air at every level of the plant, so stringing them up is smart. The second is that tomatoes love heat, and light. And we’re in this game for maximum tomatoes, right? So. Ensuring your plants get all the light and heat they need is part of ensuring a good yield. Which can’t happen so well if your climbers are slouched over in a pile on the ground. Of course, there’s lots of tomato types that don’t need to be rigged up to the roof, and which just need a bit of structure to make the most of the season. What if I don’t have anything to tie them to? 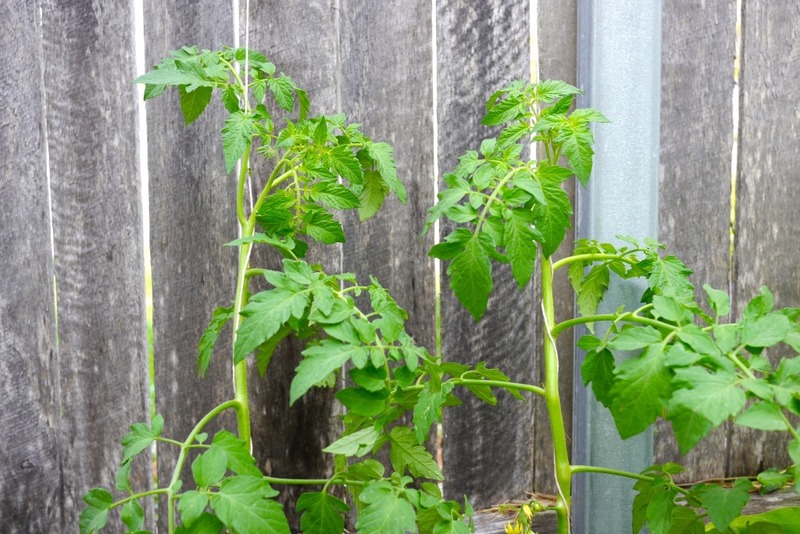 Tomato stakes – go old school and fasten them with stockings as they climb like my nana used to (quite successfully). 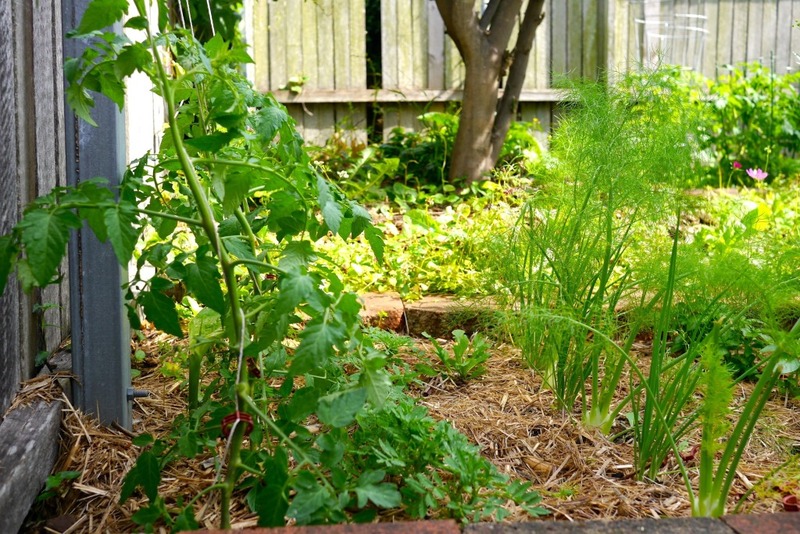 The DIY bamboo tomato cage approach – simple, strong and cheap. Those metal tomato cage thingys that garden centres have – we’re trying a few of those this year. They seem to work. Big ups to Michael Hewins, the crafty market gardener that taught us the tomato twining technique. 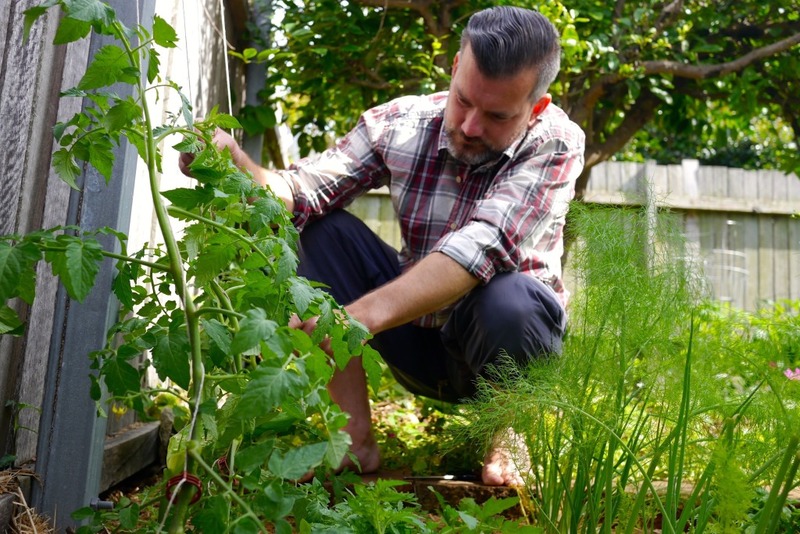 He teaches Serious Backyard Veggies + also Intro to Market Gardening courses with us in Sydney + beyond. Kirsten I have been using the string method since the late ’80’s and for 2 reasons. Firstly the ease of putting them up. Just need some structure above to tie to. 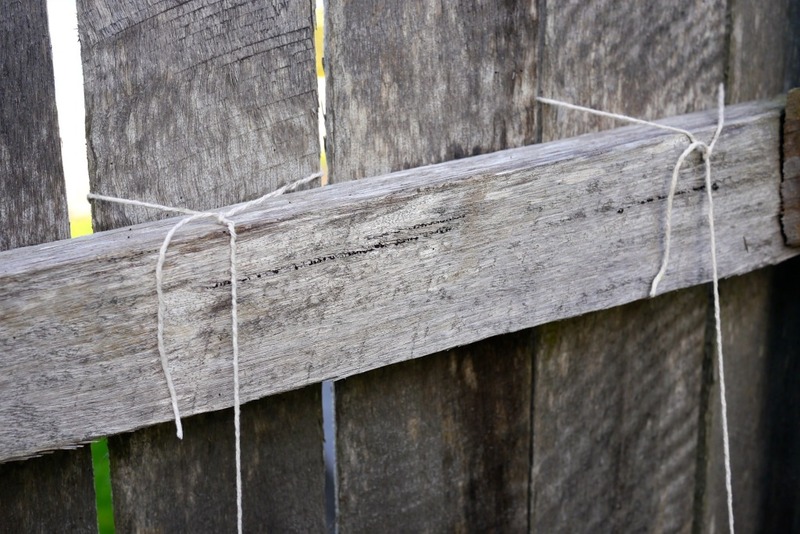 I use old (recycled from the mulching bales) baling twine which is thicker than the string you appear to use. My structure is the height I can reach from standing at ground level so 2 point something metres tall. I then do a couple of half hitches at the bottom end below a leaf axil. Remember always twirl the plant in the same direction so it is doesn’t start to unfurl when you get a load on it when in full production. Looking down I do a clockwise motion, otherwise you are spending time at each plant trying to work out which way you twirled last time. I have just come from giving my plants a twirl and several are at the limit of their string already. Secondly for disease control. 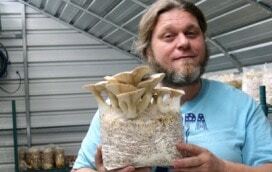 If unfortunately you do get a fungal infection in the crop or just one plant, it is very easy to cut the sting at the top and roll the whole mess up and dispose of. Stakes can harbour fungal spores from one year to the next so unless you do a thorough paint job on the stakes or scald them then you could be reintroducing fungus back into your next crop even before it gets going. 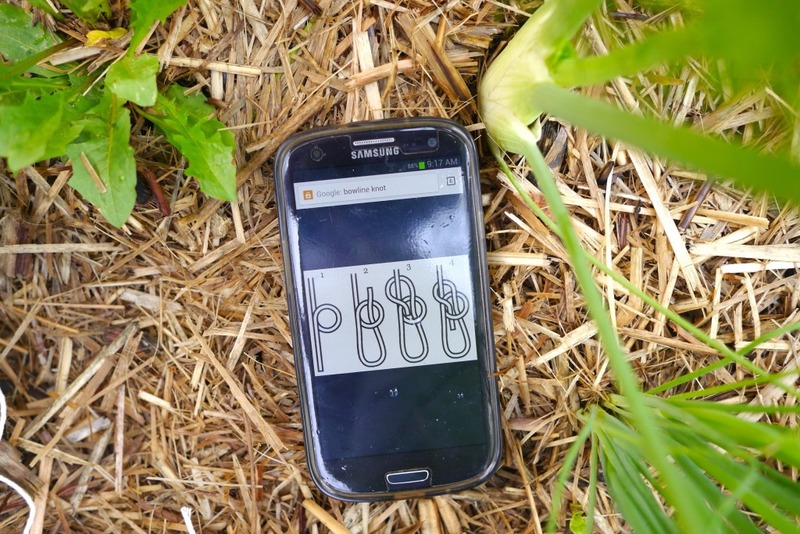 I also use vertical strings for climbing beans but horizontal ones for climbing peas. One cup of molasses mixed with a litre of water sprayed over new leaves discourages a bunch of critters including possums (seems like it would attract them but apparently not). Spikes along their access… not razor sharp scalpel spikes… just prickly plastic or bamboo will do. Also try hanging stink bombs near where they come in… an odd sock with a good handful of blood and bone in it sends a definite signal to all mammalian visitors… do not come here or this will become of you. I’ve heard of using household ammonia in a shallow cup – the smell repels them. 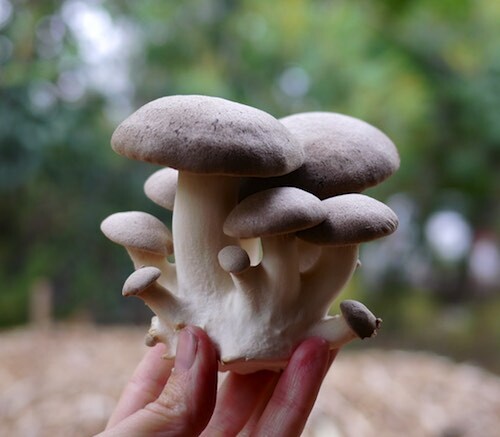 And what is the Milkwood recommendation to limit fungus, if it hits? Can tomatoes get too much sun? The place I planted them the last 2 years gets sun most of the day and my tomatoes just didn’t produce. Hmm no i don’t think they can get too much sun if they’ve got enough water + nutrients – they like a lot of all 3 to be totally happy. Try regular watering and lots of seasol + worm juice (watered down of course)? What are the best climbing tomatoes/or which ones should not be trained to climb? Hiya crew, Ive been trussing my Toms on bamboo stakes and strings. Both methods have worked well, Ive been pinching out the laterals and pruning off the leaves below the lowest truss of fruit as they ripen up the vine. 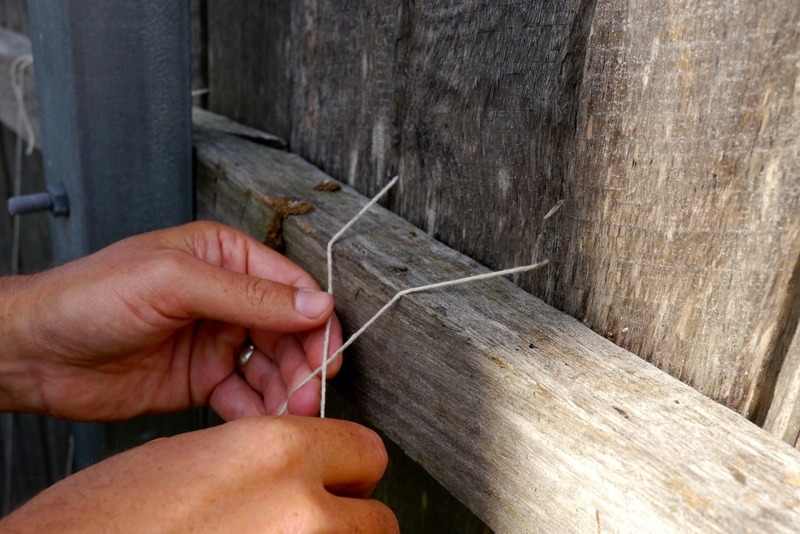 But now that my vines have reached the maximum extent of my trellis and are keen to go on – what do i do? thanks Kirsten and Jim, Ill give that a go, wasn’t sure about letting them fall over in case the stems snap and it makes for very messy rows. Some of the ones Ive had spiraled and tied to bamboo stakes i let the ties loosen and the coils have slumped down the poles which is handy. I guess i’m medium scale production, have got a couple hundred plants in. How high where your reo trellises K? My plants are getting over 8 feet now, I could give them longer poles but I don’t want to have to stand on a ladder to harvest. Joel you can just let them keep growing and they will fall down then if your season keeps going well then tie them up again after they get to the bottom. It would be a shame to cut them off mid season if they want to keep growing. Some varieties have the capability to grow about 6 metres. I often get about 4 metres of growth in mine per year. 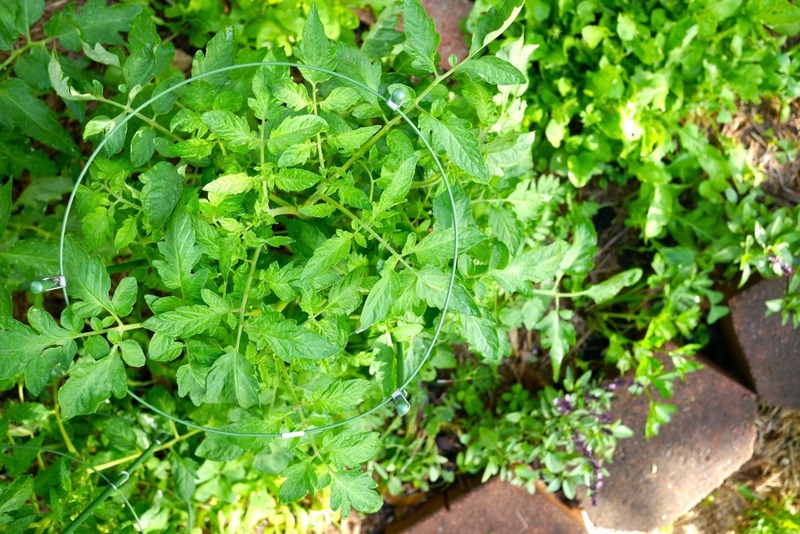 I’ve been stringing up my tomatoes for several years and find that I can plant more closely, just have to remember to pinch out the suckers to maintain a single stem per plant. For support, I sink a length of rebar at each end of the bed, then slip over that a 6 ft length of EMT tubing. A third piece of EMT the length of the bed is then attached to the 2 uprights with a corner piece, or whatever connector fits your tub=be best – scout out the aisles at Home Depot for lots of possibilities. Tie each string to the cross bar, then down to a plant. Make it somewhat snug then as in the other posts, always wind the plants in the same direction.